Blogging is the most amazing way to express yourself in the internet with the whole world, the more interesting part of blogging is you can become celebrity even you can make ton of money, I think that's why people start blogging, I know even many bloggers said don't see at money, Even I have the same concept but after few years of blogging, I have realized about this, you should see first what you will provide in your blog, that's why people will come to your blog, which will make you money as well as celebrity. Of course it is depend on yourself, what you wanted to get from blogging? Let's talk about the topic, actually after few years, I have again watch the video, although when I have studied in that time, I have read the story even sometimes I heard about the story from my father, when I did not listen to him! So, today I was thinking, why not to use this concept in blogging? I think, this is a perfect concept for blogging, if you will follow, I know you will become next tortoise in blogging, I mean you will become a successful blogger, that is sure. Probably, you are thinking, why is this so? Here is the reason behind this! Because when people started blogging, they become aggressive after knowing one tip about blogging, although this is normal, even I become aggressive, when I have started blogging. There is simple one reason, I did not know about internet too much in that time, even I am not belonging from this field, in profession I am a Mechanical Engineer, but I am passionate about blogging. Actually, I am saying this because, when people become aggressive for doing anything, then the result never be good, that means you have to keep going step wise, like for an example it is good to publish one blog post daily rather than publish 10 blog posts a day then for next 10 days you are not publishing even single blog post. I mean there is no shortcut way to make money blogging, you have to go step by step! Consistency matter, which is about Tortoise and Hare story, right! If you don't know about this story then go to Youtube and watch this story, you will definitely going to get something important from this story, who knows, probably this story can change your life. One more mistakes people generally do, that is creating too many back links instantly, which is the biggest mistake for any blogger, I mean every one is not John Chow (He got banned from Google for three years, even than he is one of the famous blogger in the world for making money from blogging). Just after knowing any tip, use the tip but step wise, which will help you to achieve your target, but not today, definitely one day. I mean, blogging is not a one day cricket match, it's a long time match even more than a year and you have to keep playing this match, if you want to be there and even better position otherwise some one else, grab your position. Make strategies and then work on them, if you come to know any new concept about blogging, then keep it your mind but use it step by step, get it. What do you think? 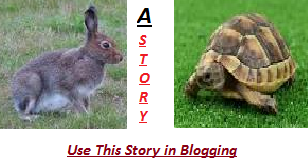 Is This "Tortoise and Hare" story useful in blogging? Yeah, keep going bro if you required any help let me know.